Mulching is very important if you want to maintain and enhance the growth of your landscape plants. Mulch is indispensable in conserving moisture in the soil. It also helps make the soil well nourished while keeping it weed free. Four Seasons Landscape Management offers mulch materials and mulch installation for your properties in Georgia, both residential and commercial, making garden maintenance easy and very convenient for you. Wood Chips or Bark - This is one of the common choices for mulch installation. It can be provided in large pieces for durability or shredded for a better cover during heavy rains. Most people prefer this because it looks good in a garden. Straw - Although this type of mulch is not very visually appealing, it works really well in fertilizing plants, especially during winter. Pine Needles - Mulching with this material is highly recommended for acid-loving plants. Leaves - These materials need to be shredded before they are applied in order to prevent them from getting dragged away by the wind. This encourages plants to grow and, when dried, keeps the soil warm enough during cooler months. Peat Moss - This is great for landscapes because it looks attractive. It can lower the pH of a soil, making it ideal for acid-loving plants. Compost – This is another good option for mulching since it can provide enough nutrients to plants. 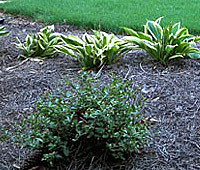 Inorganic mulch can also be used to maintain the health of plants, promote their growth, and prevent weed from growing. Shredded old tires can be used. Plastic sheets can also be used by laying them over a garden bed and punching holes to make rooms for plants. Rocks or gravel is also a common material for inorganic mulch installation. It helps enhance the look of a garden while suppressing the possible growth of weed around plants. It also helps retain heat during cooler months. 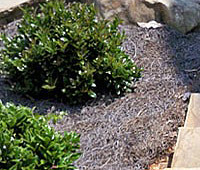 There are also other types of mulches which could be colored or dyed for a beautifying effect. Four Seasons Landscape Management provides professional installation in Newnan and other locations in Georgia at a very affordable cost. Although inexpensive, we make sure that the application is appropriate and accurate. Need more information on mulch installation? Call us today!